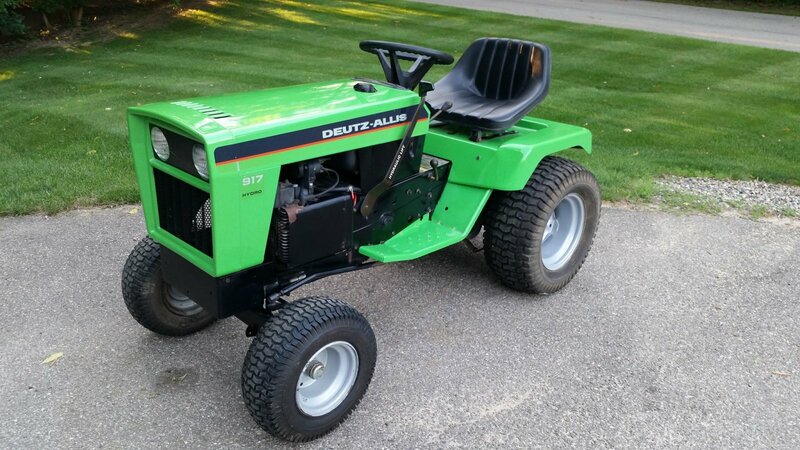 Deutz-Allis offers four deluxe tractors designed to handle everything from heavy-duty tilling and plowing to grading, mowing large lawns or clearing heavy snow. Three are powered by quiet, smooth and dependable Kohler engines from 12 to 16 horsepower. One uses a long lasting diesel engine. All are loaded with practical features that make them easy to operate and maintain over many years of heavy-duty service. 1. Cast iron engine power. Air cooled design with light-weight aluminum crankcase and cast iron cylinder barrels means long engine life and minimum maintenance. 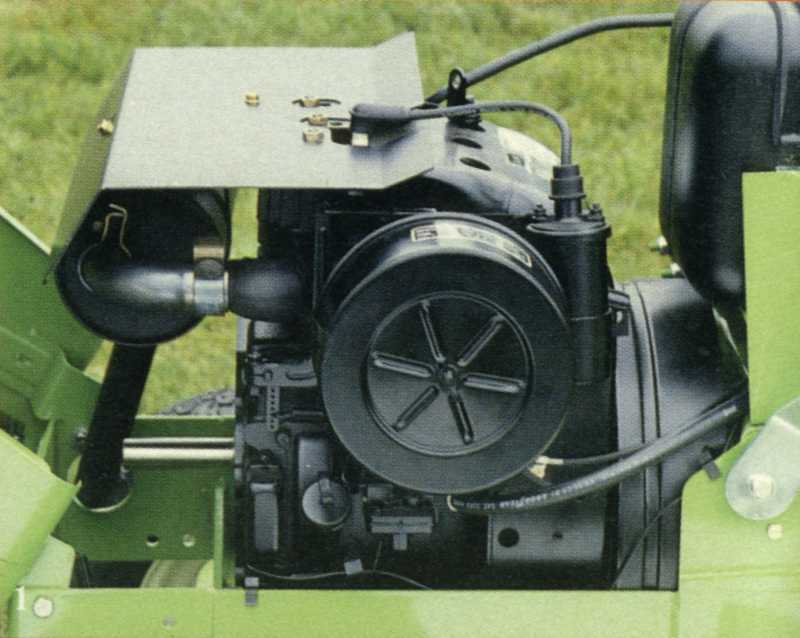 Single-cylinder Kohler engines on 12, 14 and 16 hp models are dynamically balanced horizontally and vertically for smooth running with minimum vibration. Starting is easy in any weather. 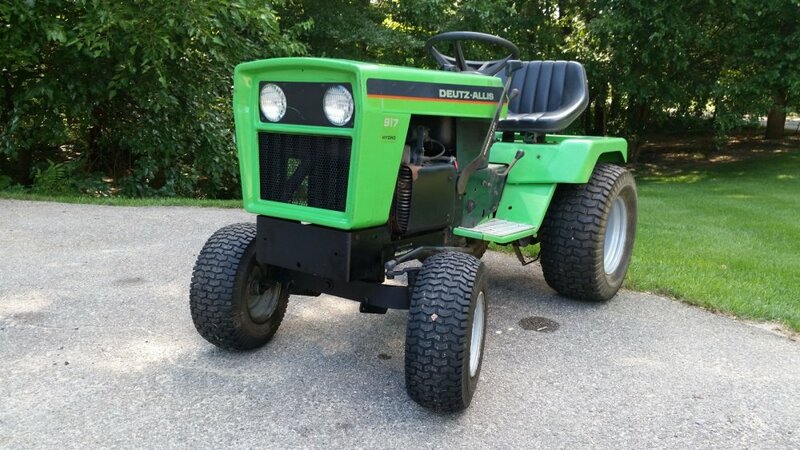 For extra long life and fuel efficiency, Deutz-Allis offers the 18.5 hp Model 920, powered by a rugged Briggs & Stratton Lombardini air-cooled 2-cylinder diesel engine. 2. Hydrostatic transmission. No clutching or shifting. Just move the single-lever control forward for infinite speeds up to 7 mph. Or move it back past neutral for infinite reverse speeds up to 4 mph. 3. Hydraulic implement lift. Lets you select any implement height-and change it-with finger-tip ease. Like all 900 Series controls, lever is easy to reach, yet out of the way when getting on or off. 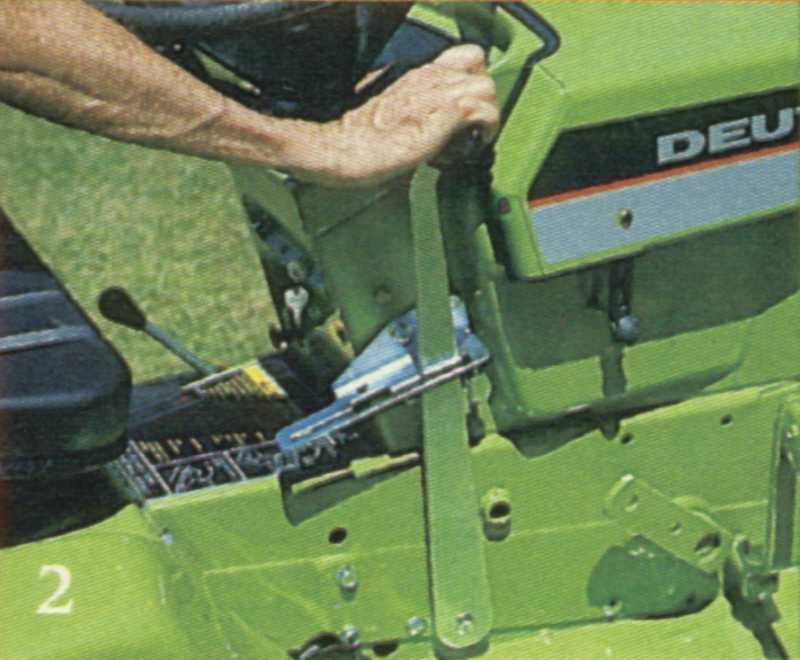 Standard on 916 and 920 tractors. 4. Controlled traction. Limited slip differential automatically shifts power to the wheel with most traction. Reduces spinning, keeps you going over muddy, icy or slippery terrain. 5. 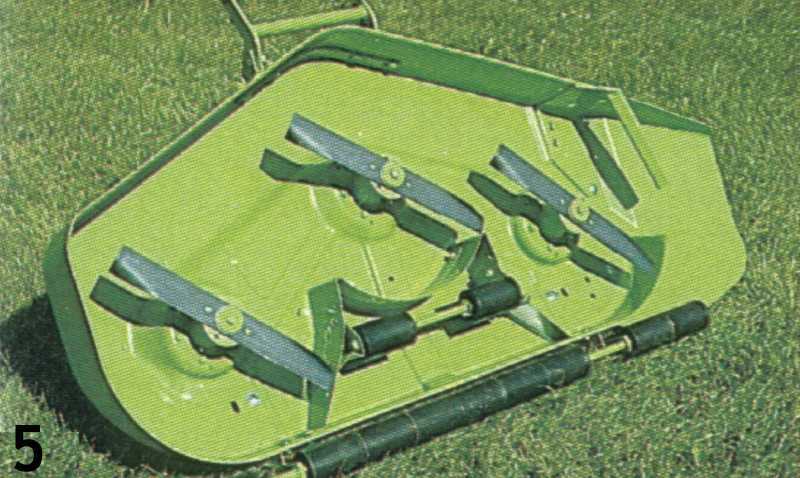 Deep-deck, anti-scalp mower. 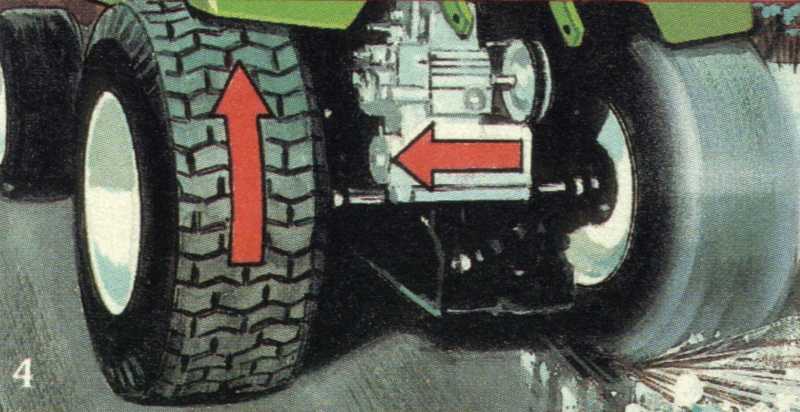 Attaches directly to front axle, so front wheels act as gauge .,wheels and follow ground contours. Rollers across the rear and underneath guard against scalping from bumps and dips. 5A. 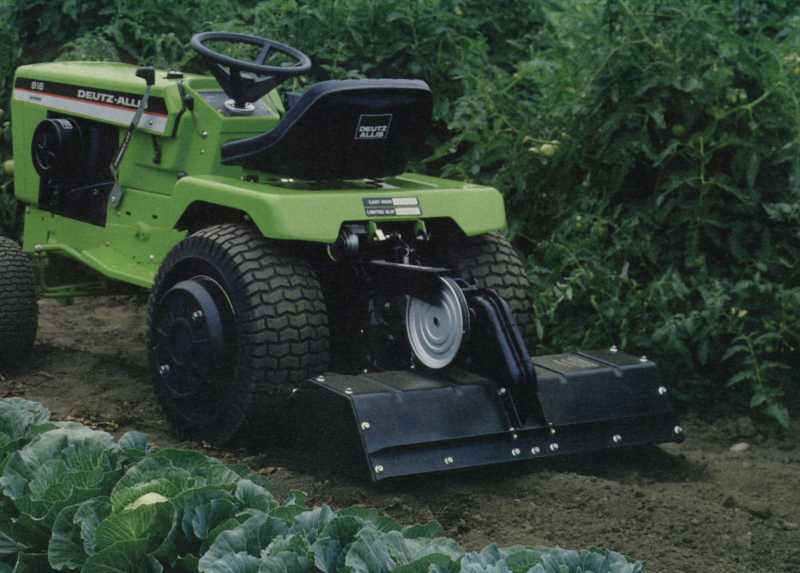 Rugged deep deck allows ample air flow for effective discharge of clippings and mulch even under difficult conditions. Three overlapping blades give smooth, even cut. Live PTO. 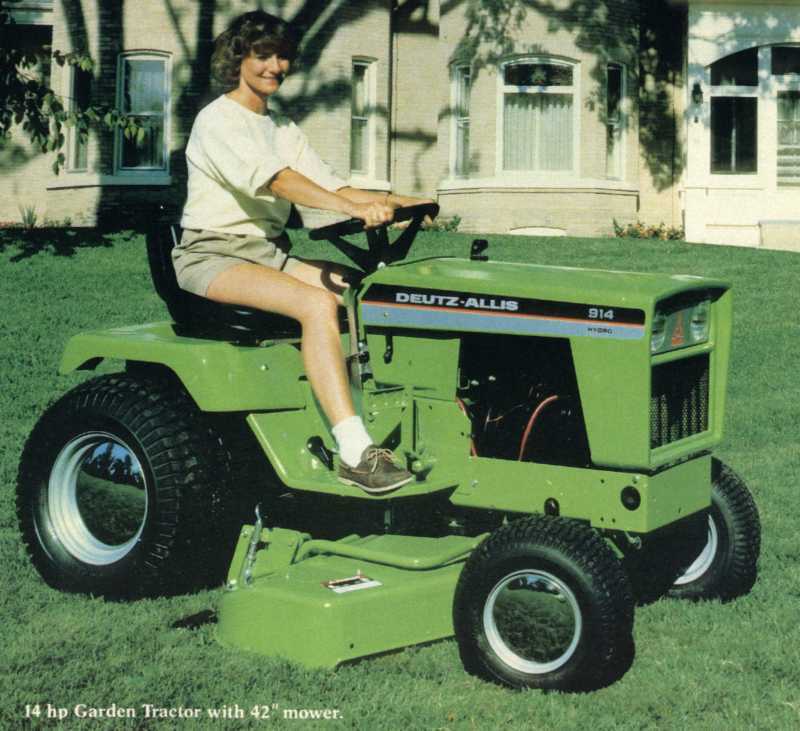 Operate attachments with the tractor in gear or in neutral. Combination mechanical cone clutch provides power to center and rear attachments without need for costly conversion kits or separate engines. In-line drive. Engine crankshaft and drive shaft are parallel to tractor frame. Power is delivered directly to the bevel gear box. Design assures long life and smooth trouble-free power transfer to transaxle. Rubber isolators cushion shock loads for smooth, vibration-free operation. Combination clutch-brake. A single pedal releases clutch and applies brake for convenience and safety. Parking brake is actuated by separate lever. 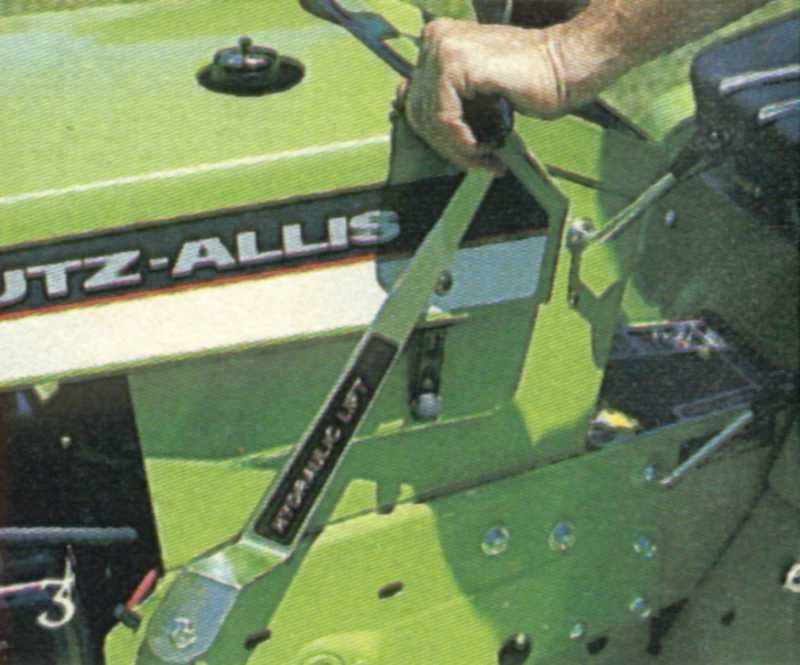 Nice original Deutz-Allis 912H with manual lift.